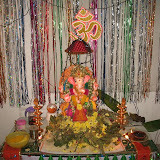 Our family offered pooja at NetEnrich office this year on Vinayaka Chaviti. Surya couldn’t join because of his examination schedule on the following day. Our coworkers and support staff participated in the rituals. After pooja, we had a photo session and prasadam (food that was offered to God) session. 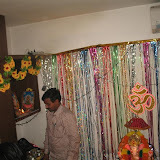 This year, our office used clay-made Ganesha idol that is environment friendly (no plaster of Paris or lead based colors.) With each passing year, it is good to see several individuals and organizations following this model. After 7 nights of hosting Ganeshji’s idol, its time for Nimajjanam (immersion of the idol in a lake or any other water body). Raghu started with the final part of the rituals and then offered the last round of food to God. There is a 11-item food bonanza arranged in the parking area of the building. Our admin and support staff worked hard to make sure that the process is very smooth. Once we all are assembled, Aravind started the auction of the Laddu. It is our typical Hyderabadi culture during this festival season, to auction the laddu and use the money for charity or related purposes. We participated in the auction as individuals but as time went on, we grouped into teams and participated. Finally our team of a handful of people won the auction. After the auction, the idol is shifted to the vehicle. we took the idol to the nearest lake and immersed it with the rituals. Our teams at NetEnrich are taking turns to offer Puja to Ganeshji. Our family’s turn came on Saturday evening. Offering of Puja is traditionally a family event and our family headed to work in the evening. It is also a custom to make Food to offer to God (and it is called Prasadam). Here are the pics from our family’s evening at NetEnrich. The photos cover only part of our staff that are on shift at that time. I got side tracked into making food arrangements rather than taking pics. Happy Ganesh Chaturdhi to all. 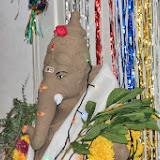 The multi-day festival season started today and here are the pics from our Puja at home. We started leisurely at about 8.00am today and winded up everything in about an hour. 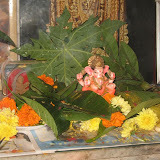 As can be seen in the last pic, Food is essential part of the offerings to Lord Ganesha during this season. The morning session of the food is very tasty. Good start to the festival season! ఈ రోజు సాయంత్రం ఒక తెలుగు న్యూస్ ఛానెల్ లో శోభారాజు గారి ఇంటర్వ్యూ వచ్చింది. (మీరు తికమక పడితే: శోభారాజు గారు ఒకప్పుడు తి.తి.దే. ఆస్థాన గాయకురాలు. “అదివో అల్లదివో” అన్న అన్నమాచార్య కీర్తన తో మొదలయ్యే ఆల్బం ఆవిడ గొంతులోంచి జాలువారిందే.) ఆన్నమాచార్య కీర్తనలను స్వరపరచడంపై ప్రత్యేకం గా సాగిన ఈ ఇంటర్వ్యూ చాలా బాగుంది. మనకు సుపరిచితమైన మరియు అపరిచితమైన కొన్ని కీర్తనలు, వాటి వైవిధ్య స్వరాలు చాలా బాగా పాడారు. ఆ ఇంటర్వ్యూ అయిన తరువాత “సిరుత నవ్వులవాడు సిన్నెక్క” కీర్తన మళ్ళీ వినాలనిపించింది. విన్నాను.